WE call this synthetic Gear Oil SVG. SVG is an extreme pressure ( EP) synthetic 75W90 gear oil. AMSOIL SEVERE GEAR Synthetic Extreme Pressure (EP) Lubricants are premium grade gear oils specifically engineered for maximum performance in severe duty applications. These state-of-the-art AMSOIL formulations feature an exclusive blend of high viscosity, shear stable synthetic base oils and an extra treatment of high-performance additives. AMSOIL SEVERE GEAR Synthetic EP Lubricants maintain their viscosity for long-lasting protection against metal-to-metal contact. The proprietary AMSOIL additives form an iron-sulfide barrier coating on gear surfaces, providing the ultimate line of defense against wear, pitting and scoring. AMSOIL SEVERE GEAR lubricants help prevent Thermal Runaway a phenomenon caused by a lubricant's inability to control friction and increased heat under high-stress conditions. By controlling thermal runaway, AMSOIL SEVERE GEAR Synthetic EP Lubricants inhibit rapid lubricant degradation and component damage. Equipment runs better and lasts longer with AMSOIL SEVERE GEAR Synthetic EP Lubricants. WE call this synthetic Gear Oil FGR. FGR is a synthetic 75W90 long life gear oil. FGR is engineered for extended drain intervals up to 500,000 miles . FGR 75W90 gear oil is available in all sizes from quarts to 55 gallon drums. Class 8 Line HaulÂ For FGR 75W90 Follow the OEM drain interval (miles or hours) for synthetic oil up to 500,000 miles or three years, whichever comes first. Otherwise, drain at twice the OEM interval for petroleum oil. Heavy Duty	Off-Road Vocational For FGR 75W90 Follow the OEM drain interval (miles or hours) for synthetic oil up to 120,000 miles or one year, whichever comes first. Otherwise, drain at twice the OEM interval for petroleum oil. We call this synthetic 75W90 gear oil MTG . 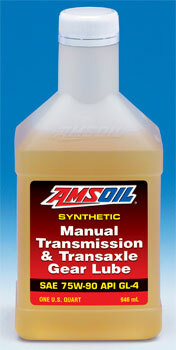 AMSOIL MTG Synthetic Manual Transmission and Transaxle Gear Lube is a thermally stable, extreme pressure formulation that resists heat, oxidation, acid build-up and varnish. It is the ideal gear lube for high temperature applications, including the New Venture NV-4500 transmission, which retains heat due to its cast iron housing and is often subjected to heavy loads and high torque from turbo-diesel engines. We reviewed the following 75w90 gear oils. Lot numbers are listed for the gear oils The cross-section of gear lubricants tested includes those offered by original equipment manufacturers (OEMs), motor oil companies and specialty companies. All gear lubes, with the exception of Mopar Synthetic and Torco SGO Synthetic, are recommended by their manufacturers for limited-slip differentials and are therefore expected to contain appropriate limited- slip-type additives. Mopar limited-slip additive was added to Mopar Synthetic and Torco Type G limited-slip additive was added to Torco SGO Synthetic at the recommended levels to ensure equal testing. Each gear lube tested is listed in the following chart along with the performance specifications identified on the respective bottles. Batch codes are also listed. Gear lubricant specifications are established for minimum performance levels. The active API gear lubricant specifications are API GL-4, GL-5 and MT-1. API GL-4 designates the type of service characteristics of spiral bevel and hypoid gears in automotive axles operated under moderate speeds and loads. These gear lubes may be used in select manual transmis- sions and transaxles. API MT-1 designates lubricants for non-synchromesh manual transmissions and transaxles. API MT-1 is independent of API GL-5. API MT-1 calls for a higher level of oxidation stability, copper corrosion resistance and seal compatibility, which is not provided by API GL-4 or GL-5. Not all gear lubes meet API MT-1 performance standards. API GL-1, GL-2, GL-3 and GL-6 are inactive. API GL-6 is identified by Lucas, Red Line and Torco as a performance specification. However, the test equipment is obsolete. The U.S. military has established separate gear lube specifications. The most current military specification is MIL-PRF-2105E, which supersedes the previous specification, MIL-L-2105D. MIL-PRF-2105E combines the performance requirements of MIL-L-2105D, API GL-5 and all but one parameter of API MT-1, thereby adding improved oxidation stability, cop- per corrosion resistance and seal compatibility to extreme-pressure axle lubricants. An additional gear lube standard, SAE J2360, mirrors MIL-PRF-2105E and is a global standard used by oil companies in countries where U.S. military standards are not applicable. Oil viscosity is affected by temperature changes during use. As a gear lubricantâ€™s temperature increases, its viscosity decreases, along with load-carrying ability. The degree of change that occurs is determined by ASTM D-2270 and referred to as the lubricantâ€™s viscosity index (VI). ASTM D-2270 examines the viscosity change that occurs between 40Â°C (104Â°F) and 100Â°C (212Â°F) . The higher the VI, the less the viscosity changes with temperature. A high VI is desirable and, in part, indicates high- er lubricant quality. It does not, however, represent a lubricantâ€™s high-temperature viscosity or its load-carrying ability. Similar to 5W-30 automotive engine oils, 75W-90 gear lubricants are defined as multi-viscosity. This means the gear lubricant has enough viscosity to protect against wear at high temperatures, as well as good flow properties at cold temperatures. Many gear lubes cannot fulfill both requirements without the use of VI improver additives. VI additives keep lubricants from becom- ing too thick to flow in cold temperatures and too thin to protect in high temperatures. VI additives have many uses. If used improperly in gear lubricants, however, they can break down and lose viscosity through a process called shearing. Because of this, the SAE incorporated the CEC L-45-A-99 (KRL) 20-Hour Shear Test as a requirement for all automotive gear lubes. This specification requires that gear lubes not shear down and fall below the minimum viscosity for that grade. The KRL Test utilizes a tapered roller bearing and test cup filled with 40 ml. of gear lube. The test parameters are set at 60Â°C (140Â°F), 1475 rpm, 5000 N load for a duration of 1,740,000 motor revolutions (approximately 20 hours). Each gear lubeâ€™s viscosity was recorded before and after the shear test as seen in the following graph. This graph shows the initial oil viscosity and the viscosity after the shear test. The SAE J306 high-temperature viscosity requirements (shaded area) for SAE 90 gear lubes are between 13.5 centistokes (a unit of measure for viscosity designat- ed as cSt) and 18.49 cSt @ 100Â°C (212Â°F) maximum. 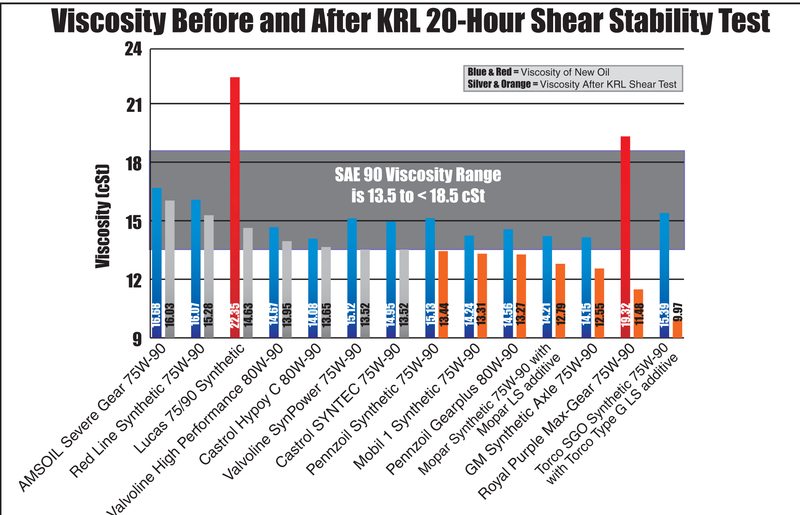 The test shows a graph of Lucas 75/90 Synthetic, at 22.35 cSt, and Royal Purple Max-Gear 75W-90, at 19.32 cSt, both exceed the maximum 18.49 cSt initial viscosity (red), failing the SAE J306 requirements for SAE 90 gear lubricants. All other gear lubricants were within the required high-temperature viscosity range prior to the KRL Shear Stability Test. Viscosity measurements following the KRL Shear Stability Test revealed that seven gear lubes sheared down below the minimum viscosity requirements (orange), failing the shear stability requirements of the SAE J306. The two gear lubes with the largest viscosity loss, as reflected in the following graph, were Royal Purple, losing 40.6% of its viscosity, and Torco SGO Synthetic, losing 35.2% of its viscosity. Royal Purple was the only gear lube to fail both the initial viscosity require- ments and the shear stability requirements. It started out too thick and ended up too thin. Torco SGO Synthetic, which had the highest VI in the previous graph, finished the shear stability test as the thinnest of all the oils at 9.97 cSt, far below the minimum 13.5 cSt requirement. Lucas 75/90 Synthetic, with an initial viscosity that exceeded the maximum requirements by 20.8%, passed the shear stability test, but lost 34.5% of its viscosity, the third largest loss of viscosity. Both OEM gear lubes, GM and Mopar, failed the minimum viscosity requirements after the shear test. Of all the gear lubes tested, half did not meet the SAE J306 shear stability requirements. 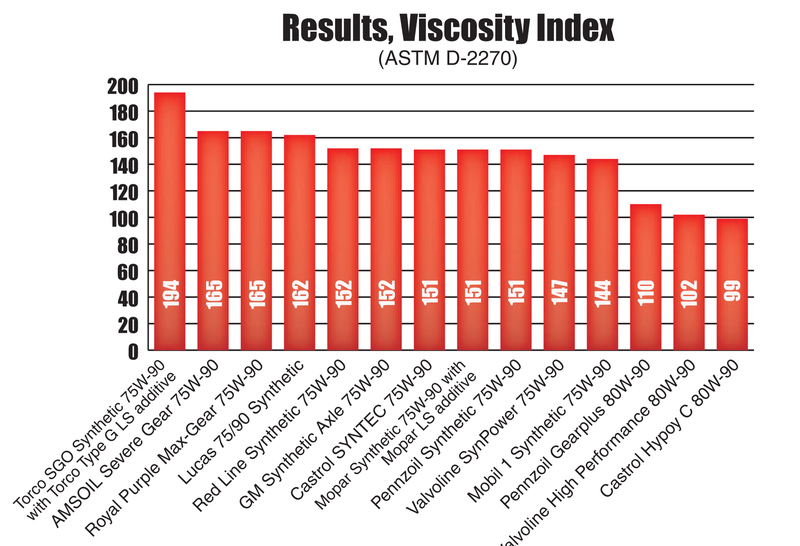 AMSOIL Severe Gear 75W-90 was in the proper initial viscosity range and retained the highest viscosity after the shear test with a viscosity of 16.03 cSt â€“ the mid-point of the SAE 90 viscosity grade. As temperature decreases, the viscosity of oil increases. Gear lubricants with high viscosity at cold temperatures are less efficient, and the gears require more energy to turn. Gears and bearings in the differential and axle housing are splash- lubricated, and gear lubricants that are too thick at cold temperatures can starve internal components of lubrication, which can cause failure. The cold-temperature viscosity of gear lubricants is indicated by the first number in the SAE viscosity grade (75W of a 75W- 90 gear lube). The SAE J306 standard utilizes the Brookfield Viscosity Test, recorded in centipoises (cP), to determine cold- temperature performance. The maximum viscosity is 150,000 cP at the given temperature for the SAE viscosity grade. For example, SAE 75W must be less than 150,000 cP at -40Â°C (-40Â°F), while SAE 80W must be less than 150,000 cP at-26Â°C (-15Â°F). In the Brookfield Viscosity Test, a glass test tube is filled with gear lube and cooled to the appropriate temperature. A small spindle is inserted into the lubricant and the maximum torque required to rotate the spindle is recorded. The torque read- ing is used to calculate the viscosity in cP. Cold-temperature performance is impacted by a lubricantâ€™s high-temperature viscosity. High-viscosity gear lubes tend to have worse cold-temperature performance than low-viscosity gear lubes. AMSOIL Severe Gear, however, with the highest after-shear viscosity, exhibited the best cold-temperature properties of all gear lubes, except for Torco SGO, which thinned out of grade in the shear test. Royal Purple and Lucas failed the cold-temperature Brookfield requirements for 75W gear lubes, as well as the high-temperature requirements for SAE 90 gear lubes, effectively disqualifying them entirely from the SAE 75W-90 category. Royal Purple Max-Gear, having also failed the Shear Stability Test, was the only gear lube to fail every parameter of the SAE J306 requirements. Red Line was 14,100 cP over the maximum allowable viscosity at 164,100 cP, and Castrol SYNTEC 75W-90 had a borderline pass at 149,850 cP. As noted, SAE 80W-90 gear lubes are measured at -26Â°C (-15Â°F) and all test candidates passed. *Red Line, Royal Purple and Lucas, having failed the viscosity requirement for SAE 75W, were then tested at the SAE 80W parameters for comparison purposes. Red Line scored 18,250 cP and Royal Purple scored 24,700 cP, showing better per- formance than the SAE 80W-90 gear lubes. Lucas, however, at 98,050 cP, showed worse cold-temperature properties than Castrol 80W-90, which is reflected in the overall score on page 19.